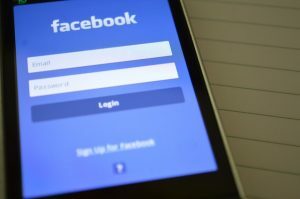 Facebook lost a record $119bn in market capitalization for a single day’s trading on the 26 July 2018. The board said revenue growth would slow over H2 2018 after weaker than expected Q2 revenues. Alphabet reported net income of $3.2bn after expensing the EU fine of $5bn. The business reported revenue growth of 26% to $32.7bn in the three months to end June 2018. Inmarsat board is confident of maintaining their independence after rejecting a revised offer from US based EchoStar Corp.
Vedanta Resources board agreed a $10.89 per share cash offer from its majority owner Volcan Investments, the Agarwal family vehicle. EC President Jean Claude Juncker and US President Donald Trump have agreed to work towards lowering trade barriers between the EU and the USA. Barclays have sold down its holding in Barclays Africa to 14.9% and henceforth the former subsidiary will not be consolidated in the group accounts. Sports Direct reported 2018 profit after tax of £27.6m from £231.7m last year after writing off £85m of losses from its Debenhams holding. Glencore reported H1 copper output jumped 8% whilst cobalt production was up 31%. UK indices had a sideways sort of month as investors digested the ongoing Sino/US, US/ EU “trade war” escalation and slow moving “Brexit” talks. The UK government is appealing to heads of state, over EU negotiator Michel Barnier who has responded the UK is wasting precious time by trying to circumvent the Commission. Sterling remains not far from lows against major currencies. A rally against the Euro seems possible when the EU relationship clarifies. If the Bank of England increases the base rate on the 2nd August this might provide a temporary lift. BATS and Imperial Brands performed strongly helped by BATS interim results showing market share gains and vaping revenue growth. So its goodbye Vedanta Resources, a perennially volatile stock, which since IPO in 2003 at 390p per share had rocketed up to 2863p during the commdities boom in 2010 only to decline to 212p in 2016. Anil Agarwal is taking the company private again at 825p per share or £2.3bn about £1bn above its IPO valuation. The Chinese government has informed the public to expect a mild slowdown in the second half, with GDP growth slowing to 6.6%, citing “obvious” financial market risks. 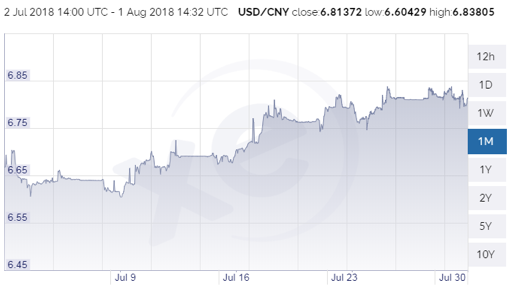 The People’s Bank of China has deliberately guided the renminbi lower over July, softening the negative tariff impact and improving China’s competitiveness. It looks like careful management with China preparing for a prolonged struggle. Concerns over the impact of a Sino-US trade war have been voiced amongst by the CEO’s of Apple and Boeing, the Port of Los Angeles (citing the potential for 20% drop in cargoes). China has matched US tariffs on a quid pro quo basis. Eurozone unemployment in June 2018 was the lowest levels since December 2008 at 8.3% with countries on the periphery with high unemployment, Cyprus, Portugal, Croatia, Spain seeing unemployment fall at the fastest rate. Eurozone growth was 0.3% in Q2. ECB president Mario Draghi has said the central bank will end QE bond purchases in December 2018. The forward guidance is Euro interest rates will be on hold until summer 2019. He has repeatedly warned against trade wars and the protectionist stance taken by US president Trump. 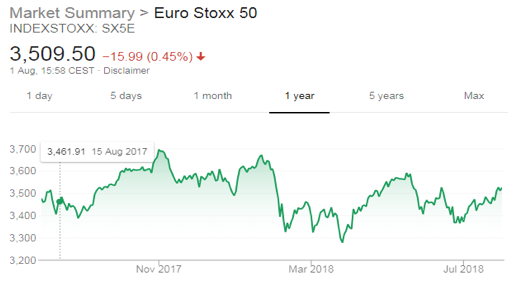 The blue chip Eurostoxx 50 index has moved up 1.49% over the last year underperforming US indices and most Asian markets excluding China. Partly this is due to the high weighting of stagnating bank and insurance companies. Another is the Euro’s strength against trade partners and export orientation. Investors are re-thinking the “FAANG” contingent with increasing divergent views of Facebook, Apple, Amazon, Netflix and Google. Previously investors tended to bulk buy all of these stocks. Prior to “Facebook Thursday” revenue growth estimates for the social media website were “in the 40s” i.e. north of 40%, now these estimates are coming down to “the 20s”. One key challenge is the news feed on Facebook, has the limit been reached for advertising using this format? CEO Mark Zuckerberg is facing pressure to appoint an independent chairman and split his role of Chairman/ CEO. Twitter Q2 also caused a 19% share price drop. Its US monthly active users were flat at 68m over Q2 2018 a similar trend in total user growth up just 2.7% to 335m. Key growth initiatives, streaming partnerships, new ad formats will take time to develop. Apple and Alphabet look unstoppable. Alphabet reported $32.66bn in revenues about $0.5bn above estimates with net income of $3.2bn absorbing a $5bn EU fine competition abuses relating to Android. Apple had an impressive quarter with the average iPhone price rising to $724 and 31% growth in Apple services (App Store, Apple Music and Apple Pay).